I was reading about film cameras the other day and read about the Pentax ME. Several articles raved about how small and simple it was to operate. Just a basic manual focus aperture priority-centric camera. I said, Steve, you need to have one of these. I said, Steve, you're right. So, guess what, I jumped onto eBay and purchased one via Buy It Now. The camera I purchased came with a Takumar-A 28-80 macro zoom. I would prefer a 35mm or 50mm, but the camera was clean, tested, and well, I can get a prime later if I need one. The entire kit was way less than $50. Not bad. First impression - the first thing I noticed when I felt the camera after unboxing is how small it truely is. It's clearly the smallest of my SLR film cameras. It's really just a bit bigger than my digital Sony A6000 walk around camera. However, it's rugged and with the lens quite heavy. Actually, the camera is almost too small to hold comfortably. I don't have really big hands and even for me it's a bit dinky. That's cool however. As a side note, I was up in Chicago this week and went to Central Camera. They had several Pentax ME's for sale and none was cheaper than $150 with no lens. So I felt good with my purchase even if the eBay purchase was just so-so. Anyway, I popped in a few fresh A76 batteries and it appears to work just fine. Film loaded smoothly, seals appear tight, but like the description indicated the hotshoe is toast. That's OK. 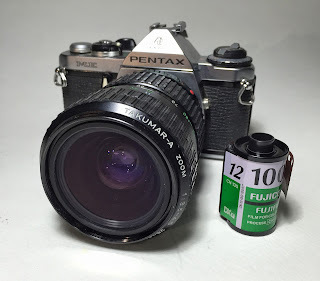 I loaded the camera today with a 12 exposure roll of FujiFilm 100, and I'll let you know how it works! More to come.